Heartland Alliance Health (HAH) is dedicated to serving those most often overlooked in the healthcare system. Not only do we care for these people – low-income individuals and families, individuals experiencing homelessness, or facing substance use disorders – we seek them out to offer our support. This approach is woven throughout our philosophy of care. We began providing health, dental, and nutritional services at the height of the AIDS epidemic. Since then, we have provided thousands of connections to healthcare partners and providers. Sarah Dickson (pictured at right), who is the organization’s traveling nurse practitioner, understands the impact of the connections made. 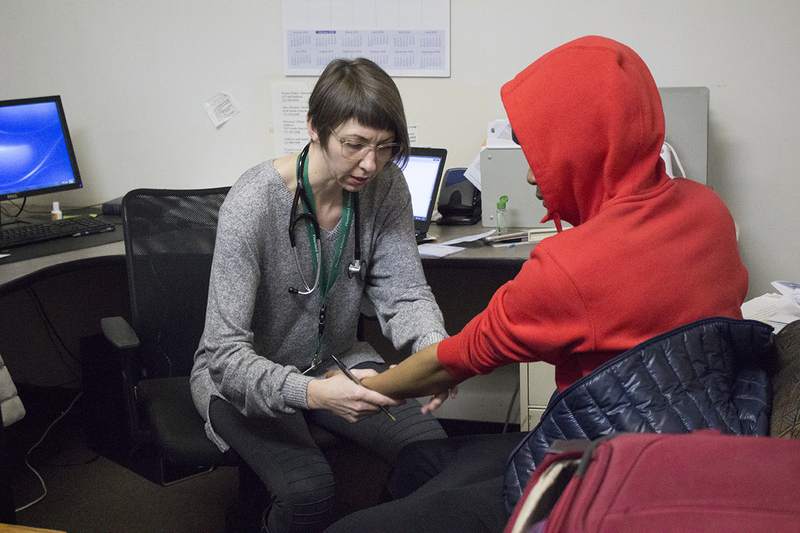 With two long-running facilities on Chicago’s North and West sides, HAH has been able to provide a safe and welcoming space for individuals seeking a healthcare professional who practices without judgment or bias. The organization is expanding access for participants by opening a new healthcare center on the South Side on March 20. And throughout the center’s development, Sarah has been dedicated to providing services for individuals in communities like Englewood, Garfield Park, and Bronzeville. Stopping by shelters like Matthew House and Teen Living Programs, Sarah is able to bring healthcare to the people – giving those without a stable home or healthcare practitioner some relief and a chance to heal. The outreach Sarah provides can be a life-changing experience. The initial connection oftentimes develops into a long-running relationship between the participant and HAH that enables the organization to also provide housing, employment, and supportive services. However, it easier to maintain consistent care when there’s a permanent location for services. But that is all about to change. This month, Heartland Alliance Health is proud to be opening its Englewood Healthcare Center, where we will house a full staff of medical practitioners – from doctors and nurses, to clinical counselors and pharmacists. Finally, Sarah will have a nearby location to send individuals after their initial connections. Learn more about Heartland Alliance Health.